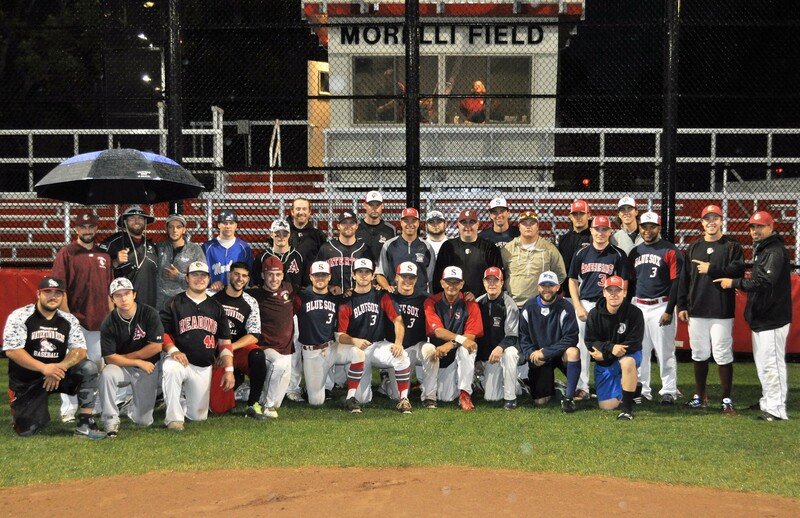 Melrose – The Intercity League hosted the Fifth Eastern Mass Amateur Baseball Classic and again played the role of poor hosts as they won 6-3 over the Cranberry League in a rain-shortened five-inning contest at Morelli Field. The ICL hosted the inaugural event in 2012 at Lexington High School and defeated the Cranberries 6-5 for the title. Last year the ICL won 6-3 over the Yawkey League at Brockton’s Campanelli Stadium. The hosts struck for four runs in the first, the biggest first inning in tournament history, as all nine batters came to the plate. Mike Burgoyne (Andre Chiefs) started the inning with a single to right and moved to second on a walk to Jon Barber (Watertown Reds). After an infield out moved both runners up, Zac Talis (Reading Bulldogs) walked to load the bases for Watertown’s Dan Chaisson. The slugging third baseman doubled down the right field line to drive in two runs and it was 2-0 ICL. After the second out, Kyle Boudrais (Arlington Trojans) singled to center to drive in Talis and Chaisson and it was 4-0 Intercity League. The offense struck again for the ICL in the second inning. After two infield outs, Scott Searles (Wakefield Merchants) doubled to right. Talis walked again, and Chaisson singled to right to plate Searles and it was 5-0. Watertown first baseman Justin Forman drove in Talis with a single to left for the 6-0 lead. Chaisson was a unanimous choice for Tourney MVP. On the day, he was 3-for-3 with three RBI, and a run scored. He drove in three of the first five ICL runs in the championship game. Reading Bulldogs pitcher Wayne Lundgren started the championship game and pitched two shutout innings for the win. He gave up two hits and struck out three. Lundgren set down the first five batters he faced, three by K. He did not allow a ball out of the infield, until consecutive singles snapped the streak. Sam Kasten (Andre Chiefs), who in his two innings of work also struck out three, walked one, and gave up the first CBL run when Tyler Beach singled to score Marc Doyle, followed Lundgren on the mound. The Cranberries cut the lead to 6-3 on a two-run single by Matt Nicholson off Mike Curtis (Reading Bulldogs) in the fourth inning. This year’s tournament had seven inning games, instead of nine, as in the past. Due to that the championship game started almost an hour ahead of schedule, but unfortunately still was cut short by the rain. Intercity League players had taken the field for the top of the sixth when the skies opened up and the rain came pouring down. The teams waited for 15 minutes and then the umpires declared the game called. In the first game of the day the Intercity League defeated the Boston Park League 6-3 (sound familiar) to move into the championship game for the third time in five years. 2016 ICL All-Stars lineup for national anthem. Ben Johnston (Arlington Trojans) had a bases-clearing triple in the second inning to give the host team a 3-0 lead. The ICLers added two runs on a double by Searles and an RBI single by Tom Petry (Melrose Americans) for a 5-3 lead in the fifth. They closed out their scoring with an RBI single by Barber in the sixth that scored Kyle Devin (Reading Bulldogs). The Park League chipped away at the Intercity’s 3-0 lead and tied it in the fourth with their third consecutive one-run inning. With one out in the fourth, the Parkers had three consecutive singles, with JP Knight driving in Sam Miller to knot the score at 3-3. Knight’s RBI double put the Park League on the scoreboard in the second inning as he drove in Grant Bowen. In the second the Park League’s Chris Hoyt leadoff with a walk, stole second and took third on a throwing error. He scored on an infield out by Alex Venditti. 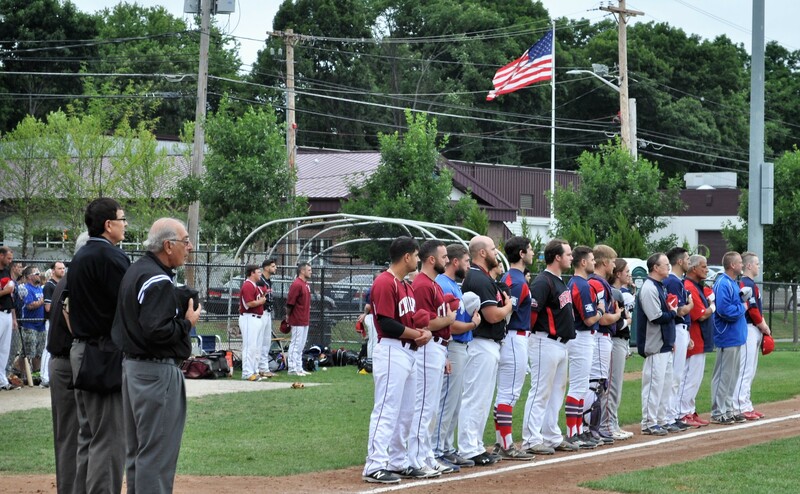 Lexington manager Rick DeAngelis guided the ICL All-Stars to victory for the second time. He also led the squad in 2012. Melrose manager Kevin Burgoyne, Wakefield manager Dave Ellegood, Somerville manager James McConville, and Chiefs assistant coach Anthony Durkee ably assisted him. Warming up the relief pitchers were bullpen catchers Derlin Tejeda and Connor Green from the Blue Sox. For the second time a championship, game was shortened by weather in the five years of the event. Both times the Cranberry League has been on the losing end. In 2013, they lost to the Yawkey League 7-6 in a three-inning game called because of fog. All three games featured good baseball and entertained the crowds all day long. 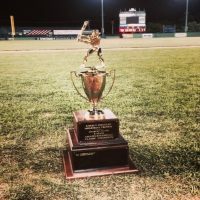 In the fifth year of the event, that features the best players from the four Greater Boston amateur baseball leagues, once again displayed the best baseball talent in Eastern Massachusetts. Thanks to the hard work of Joe Paolucci of the Cranberry League, Walt Bentson of the Park League, Rick DeAngelis of the Intercity League, and Marc DesRoches of the Yawkey League this event was again a success. Also thanks to the Kevin Burgoyne and Orazio Azzarello of the Melrose Americans for hosting the event. In addition, thanks to the Melrose DPW who got the field ready for play for all three games. All four leagues thank all the fans that came out and watched a great day of amateur baseball. Park – Kyle Musco, Connor Farrell (2), Rich Scanlon (3), James Bussiere (4), Tom Simas (5), Kenny Henry (6) and James Patti, Mike Davis (5); ICL – Aidan Freeburg, Tim Dunphy (3), Steve Keskinidis (5), Christian Rosatti (6), Jimmy Hill (7) and Alex Voitik, Kyle Devin (5). WP – Steve Keskinidis (1-0). LP – Tom Simas (0-1). SV – Jimmy Hill (1). WP – Ian Searles (1-0). L – Stephano Stravoravdis (0-1). SV-Trevor Cooley (1). Game called after five innings on account of rain. Lundgren, Sam Kasten (3), Mike Curtis (5), Shawn Smeglin (5), and Jordan Pallazola, Chris Butler (5). WP – Wayne Lundgren (1-0). LP – Zack Schindler (0-1). SV – Shawn Smeglin (1) .